Though bowed stringed instruments have existed for thousands of years, those we recognize today as violins, violas and cellos were crafted by 16-century Italian luthiers. The first modern violins were made in Northern Italy in the middle of the 16th Century. Seven makers of bowed stringed instruments were working in the region at this time, and the exact originator of the modern design is unknown. Luthiers, or lute makers, constructed a wide variety of bowed string instruments, including the viola de gamba, the viola de breccio, violone, violetta, lyra and lyrone. Cremona violin maker Andrea Amati created the oldest known violin, the first of its kind to have four strings, in 1555. The luthier also made the oldest violin still in existence, named “Charles IX” for the French king who purchased it. Charles IX later ordered Amati to build an entire orchestra for him. Charles IX’s love of the violin illustrates the immense popularity the violin achieved. Gasparo di Bertolotti da Salò began making violins around the same time in nearby Brescia, and it has been debated for centuries which master was the true inventor of the violin. The two towns became renowned for the schools of violinmaking. The Brescia school unfortunately perished in the plague of 1630, but the Cremona school lived on through a tradition of mentorship that culminated in the great violin masters Antonio Stradivari and Guarneri del Gesu. Stradivarius violins made by the Stradivari family are famous for being considered the best violins ever made. 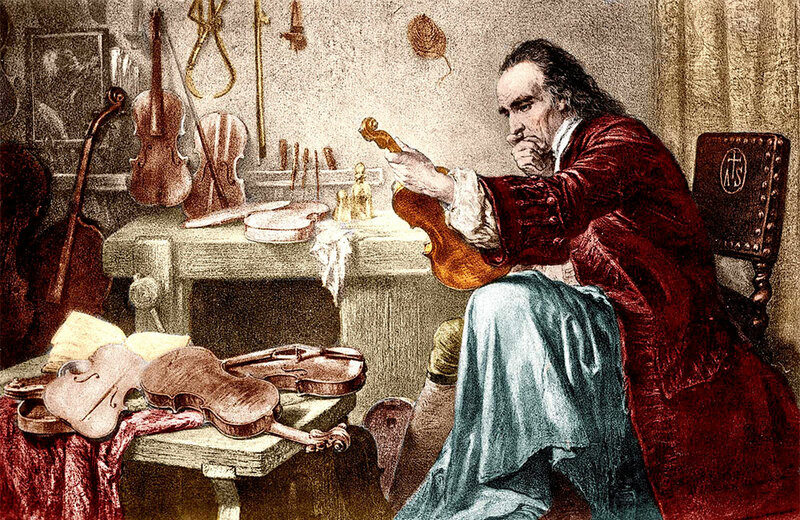 Unusually cold weather in the era of Stradivarius is just one of many possible explanations of the outstanding quality of the instruments, while others point to wood treatments of borax, silicates and vernice bianca. Stradivari spent his life perfecting the violin, of which he made thousands, and the result of his efforts has been imitated for centuries and remains the standard of excellence for violins. The violin has evolved little since the masters of the “golden age.” The neck of the violin has changed slightly in length and angle, and the bass bar has gotten heavier. Violins of the 18th Century continue to be prized and are worth millions when they appear on the market.